The new Fiat 500C Convertible is a lot like the 500 city car but comes with the added bonus of being able to (partly) drop its top to allow you to soak up some sun when you’re on the road. It looks retro and boasts engines that are lively and cheap to run. The car came about after Fiat had seen how popular the standard 500 was. They’ve stuck to that car’s principles, which means that the only real difference between the two is that one is a convertible and the other isn’t. Does it work as a convertible? OSV takes a closer look at what it’s all about with our 2018 Fiat 500C Convertible review. You only need to take one look at the 500C to see how small it is, and it’s these compact dimensions that make it so easy to drive in the towns and cities. Negotiating tight turns is a cinch, as is skipping through traffic and slotting the car into a parking space. Its steering is pleasingly precise and light, while the more expensive versions come with a button that lightens up the steering even more. This makes parking a piece of cake. In terms of the engines, some of you might be disappointed to learn that Fiat dropped all diesel engines from the range at the start of 2018. As it is, you now have a choice of two petrols – a 0.9 and a 1.2-litre unit. The 1.2-litre petrol gets four cylinders and develops just 102Nm of torque and 69bhp. It’s the entry-level model, but while its modest output can cause problems out on the motorway, it’s perfectly fine in the city. Get it up to as high as 69mph, and it relaxes, but it’s a noisy engine on the whole and could have done with a sixth gear. There is no sixth gear available, though, with Fiat offering either a 5-speed manual or a five-speed Dualogic automatic to buyers. Whichever you specify, the 1.2-litre petrol can complete the 0-62 dash in 12.9 seconds. A more powerful two-pot 0.9-litre Twin Air engine is available in two separate power guises. Both benefit from turbochargers, with the 85bhp variant able to clock 0-62 in 11.0 seconds flat. Rounding off the range is a 105bhp variant of the same engine. It comes paired up with a 6-speed manual gearbox and can get you from rest to 62mph in 10.0 seconds flat. Take the roof down and you’ll be surprised by how refined and quiet this car is. The roof doesn’t fold completely, with just the central section folding. This has obvious benefits, with the biggest one being that it keeps buffeting and wind noise to a minimum. As such, this car is quite the civilised one on the move. The dashboard comes with a body-coloured piece of trim that dominates the dashboard. 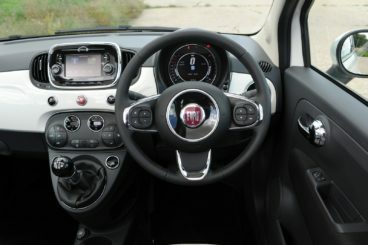 It looks great, and because Fiat has improved the fixtures and fittings of the cabin, overall quality is very good. Higher spec models benefit from a UConnect infotainment system, while a digital instrument cluster brings a dash of the contemporary to what is an otherwise retro-feeling cabin. 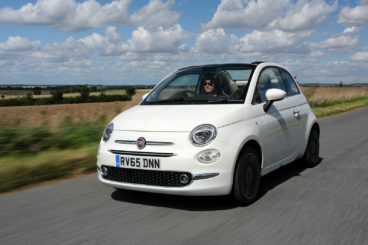 Is the Fiat 500C Convertible practical? It’s always expected that the convertible version of a car will be less usable than its hatchback sibling, but that isn’t really the case here. That said, while its 185-litre boot is the same size as the standard 500’s, it’s small compared to rivals. Storage space is decent, although buyers will wish the door bins were bigger, and while interior space is fine for anyone sat upfront, it’s a bit more cramped for those in the back. The fabric roof, meanwhile, folds easily at the touch of a button. Standard kit is okay across the range, but the entry-level Pop model feels a bit spartan. It gets a radio, 14” steel wheels, LED daytime running lights, remote central locking, electric front windows – and not a great deal else. The Pop Star model adds air conditioning, 15” alloys and heated door mirrors, while the Lounge model gets a height-adjustable driver’s seat, cruise control and a five-inch multimedia touchscreen, Bluetooth and a digital radio. The S model rounds things off with a seven-inch multimedia touchscreen, Android and Apple CarPlay connectivity, front sports seats and a unique S bodykit and chrome exhaust tip. Safety-wise, the standard 500 model used to enjoy a 5/5 Euro NCAP safety rating, but when it was retested in 2017, its score dropped to 3/5. This is mostly down to the fact that its safety kit is a bit dated (it doesn’t even include electronic stability control, lane departure warning or autonomous emergency braking). Prices for the new car start out from £14,264 and rise to £18,000. To find out more about our leasing deals, you can check out our page here. In terms of its running costs, the 500C Convertible might have dropped all of its diesels from its lineup, but all its engines are still cheap to run. The 1.2-litre engine returns over 60mpg and emits just 110g/km of CO2 which gives it a BiK rating of 21%. If you buy the Eco version, you can return as much as 65.6mpg, while its BiK rating drops to 18%. The 0.9-litre engine, meanwhile, is good for returns of 74.3mpg and emits 90g/km of CO2. That said, you’ll find it hard to reach those economy numbers unless you drive like a monk all the time. It’s cute, it’s retro – it looks good. No diesels in the range, and while Fiat’s official figures are optimistic, the two petrol engines are very affordable to run. It’s not a premium car, but the standard Fiat 500’s image carries over. Fiat has dropped them from the range for this time around. If you want a full-on cabriolet, you’ll need to look elsewhere. Let’s see how the car fares against its rivals in the comparison section of our 2018 Fiat 500C Convertible review. The new Volkswagen Beetle Cabriolet is fun to drive, great to look at and doesn’t fare too badly on the practicality front. On the road, this car’s predecessor wasn’t the best to drive. That was largely down to the fact that the chassis wasn’t strong enough to cope with the lack of a fixed roof. Fortunately, Volkswagen identified the issue and the new model does a better job of smoothing out poorer road surfaces, and thus providing a better driving experience. It’s perhaps not as responsive as the MINI Convertible but it’s more entertaining than the Fiat, and it’s moreover impressively comfortable. In terms of its engines, there’s a lot to choose from. A 1.2-litre petrol engine that develops 106bhp is the one to go for if you want to keep costs down, while a 1.4-litre TSI petrol that develops 158bhp is a solid all-rounder. It’s our top pick. However, if you want as much pace as possible, the 2.0-litre TSI petrol that develops 218bhp is capable of some pretty breakneck speeds. A pair of 2.0-litre diesels round off the range and they’re the most economical. When fitted with BlueMotion Technology, the 2.0-litre TDI diesel is able to return 64mpg while emissions stand at 115g/km of CO2. The entry-level 1.20-litre petrol engine, meanwhile, is good for returns of 51mpg, while the 1.4-litre petrol engine benefits from turbochargers and can return as much as 46mpg on a good day. Inside, the Beetle is surprisingly well insulated for a cabriolet. Even when the roof is down, the car is barely any louder than the coupe variant. Buffeting isn’t an issue either. The roof takes just 9.0 seconds to fold down and can be operated at speeds of up to 31mph. The dashboard is clean and easy to live with, but like the Fiat, the entry-level Beetle is a bit sparsely equipped. 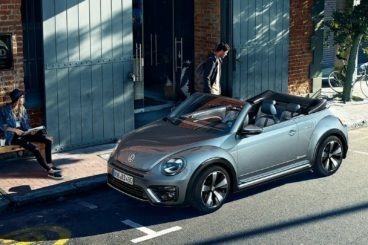 Is the Volkswagen Beetle Cabriolet practical? It’s not as practical as the standard Beetle Hatchback, but it’s more usable than the Fiat. Its 225-litre boot is bigger than the 500 Convertible, but fitting adults into the rear is a bit of a squeeze – as it always is with cars like this. The new MINI Convertible is fun, stylish and retro, and it gives the Fiat a serious run for its money. Despite lacking a fixed roof, this convertible variant is almost as fun to drive as its hatchback sibling. It runs a bit wider when you take bends with too much enthusiasm, but the steering involves you a lot, and it’s nice and accurate. The car is super agile too and offers plenty of grip. Buyers can choose from three different driving modes – Green, Mid and Sport – with the latter priming the car so that it’s as exciting as possible. Overall, the MINI offers a better driving experience than the Fiat. In terms of its engines, the sole diesel unit is a 1.5-litre Cooper D model that develops 115bhp. It has a 0-62 time of 9.9 seconds but might be a tad too noisy and coarse for some of you. A 1.5-litre engine sits at the bottom of the petrol range, but it’s significantly smoother, quieter and faster than the diesel. 0-62 is dispensed within just 8.8 seconds and it’s a lot of fun. The Cooper S is well over one second faster, while the 2.0-litre 228bhp petrol engine that powers the John Cooper Works model can motor its way from rest to 62mph in a matter of 6.6 seconds. Running costs? The diesel might not be the most popular engine but it’s the cheapest to run; it can return 74.3mpg and emits just 100g/km of CO2. The 1.5-litre petrol engine, meanwhile, is good for returns of around 58mpg economy, while the Cooper S manages 46.9mpg. Inside, the MINI Convertible looks better than ever. It’s luxurious at times, there are high-quality materials everywhere, and insulation is good when the roof is down. That said, because this is a fully fledged convertible, rear seated occupants will struggle more with the wind than those sitting in the back of the Fiat. Is the MINI Convertible practical? It’s more accommodating for rear seated passengers space-wise, and while there’s still only room for two, head and legroom back there has been improved. The folding roof has also been redesigned and now takes just 18 seconds to fold. This is the drop-top version of the popular Fiat 500 city car. It’s not a fully fledged convertible, but it still offers a fine wind-in-your-hair experience for decent money. Thanks to its compact shape, it’s super easy to live with on the road and it’s just as retro and fun as the standard model. The Fiat 500C Convertible is ideal for city dwellers who don’t want any hassle, don’t want too much power, but who want to enjoy themselves when the sun comes out.